For each issue of Literary Mama, Literary Reflections shares a writing prompt, inviting our readers to respond. Our editors provide feedback on the responses we receive, and we post our favorites on the blog. 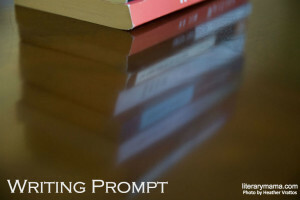 This month's writing prompt is inspired by Kandace Chapple's essay The Single Sentence. Kandace Chapple describes in vivid detail the trip she and her sisters and father made to the funeral home following her mother's death. Grappling with shock and grief, she nonetheless observes with a writer's eye the details of the business of death: rows of pull-out coffins in metal and wood, a selection of vaults and handles, even the fill-in-the-blank obituary form, which she coolly pushes back across the table to the funeral director. As the writer in the family, she will write an obituary worthy of her mother's memory. But capturing her mother's life in a few paragraphs isn't as easy as it seems, and she is disappointed with her initial effort. "This could describe anyone's mother," she tells her sister before asking her to leave the room. Alone, she gives in to waves of grief and writes a single sentence: Judy loved summer afternoons sitting on her deck out back, with her girls. The sentence became my mantra as a new mother. I was just 32 years old, and my sons were two and four when my mother died. And in the days and months and years after losing her, I did what she had done. I started to choose quiet afternoons, little feet on green grass, the shade of trees, the warmth of the sun. I was never inside with my babies, not if I could help it. We slowed down, and we took time. Have you ever written something that caused you to make changes in your life? Perhaps they were small changes or perhaps they were profound. What were the circumstances that caused you to write? How did your life change as a result? Read Chapple's essay and submit a 500-word response to this writing prompt by April 8, 2019, for feedback from our editors. Email it to LMreflections (at) literarymama (dot) com and note "March Prompt" in your subject line. Please do not attach the essay but paste the response in the body of the email. Susan Bruns Rowe lives in Boise, Idaho, and has two children in college. She has an MFA in creative writing from Boise State University and teaches writing workshops for The Cabin and The Osher Institute. Her writing has appeared in Brevity, Creative Nonfiction, The American Oxonian, and the book, Fighting the World’s Fight: Rhodes Scholars in Oxford and Beyond.